"Don't stop helping other people, don't pass by, don't be afraid to look upon the wrecks"
The Cypriot Final was held at the International Conference Centre in Nicosia on March 23rd, hosted by Marina Maleni. The winning song was chosen by a jury of 24 people. Kyriakos Zymboulakis & Demos Van Beke came 19th at the ESC. 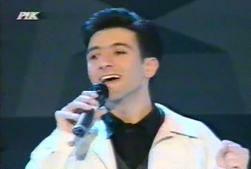 Alex Panayi was a backing singer for Cyprus in ESC 1989 and 1991.